I love bold color! This sweets table by Amy Atlas is one of my favorite color combinations: deep aqua, pink, and pinkish purple. It’s strong and feminine at the same time. 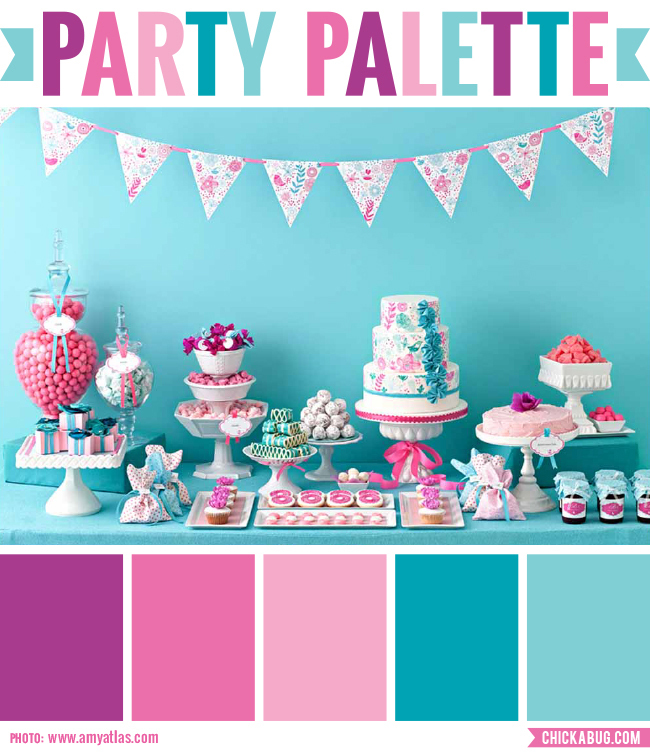 Check out more “Party Palettes” (color palettes to inspire your party planning) here. You can also follow my special “Party Palettes” Pinterest board. I am so loving this color palette! Makes me want to have a party to do this palette with :) so pretty! I love these colors, such a great mixture. Any suggestions on where to find white pedestal bowls, etc like these? Hi Cindy! There are many places that sell them online. You may also be able to find them in your local home goods stores. Wondering if those colors above are from a paint pallet? If so, wondering what the turquiouse is called. My daughter would like to use thei color on her wall. Thank you! Hi Aly! No, they're not paint chips. Sorry!